Clerk.io makes your customers buy more, by personalising and automating the products you show. Among other features, the system allows you to include dynamic product recommendations in your email campaigns, which are tailored to your message and personalised for each recipient, based on their purchase history. 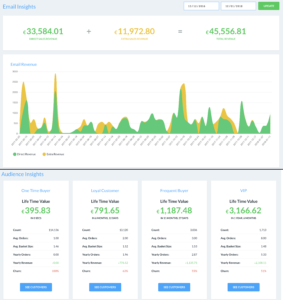 With our Audience feature, you can even segment your customers based on their behaviour in the shop, ranging from where they are in their lifetime, to whether they have shown an interest in specific products. This allows you to target customers much more efficiently. Pricing is based on usage.